Ben Watson’s great run into the penalty box in the 34th minute of the recent Maribor match enabled him to put Latics into the driving seat with a 2-0 lead. Watson’s header was spot-on, but would not have been possible without a wonderful cross from Jean Beausejour on the left. One of the features of Latics’ historic first home match in the Europa League was the width with which they played. Maribor were stretched in coping with Callum McManaman on the right and Beausejour on the left. The Chilean received an ‘assist’ for Watson’s goal, but should have had more as he laid on chances that were spurned, despite his sublime crosses. There are fans who don’t like Beausejour’s style or say he is lazy. He is not the kind of wide player who can speed past a full back to the by-line. Neither could David Beckham. However, like Beckham he has the ability to squeeze through inch-perfect crosses from tight situations. Beausejour played largely as a wing back in the past couple of seasons – the most demanding position as far as running and sacrifice are concerned. Maybe the Chilean looks a little chubby and ungainly, which gives people the impression that he is lazy. The reality is that he is a team player who does not shirk his responsibilities or hide during a game. 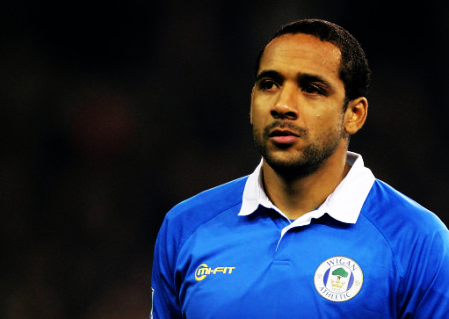 Last season Beausejour provided seven Premier League assists, one less than Shaun Maloney. Although he only joined the club in the January transfer window he led with five assists in the 2011-12 season. The Chilean has sometimes been employed at left back under Owen Coyle, which is not his best position, but gives the manager more options. If the opposition play without an orthodox right winger Coyle might continue to be tempted to put Beausejour in that position to provide a more attacking balance on the left. Callum McManaman was starting to look more like himself before he was taken off early in the second half against the Slovenian side. It has been a difficult season for him so far, fighting injuries and illness. At his best he can stretch any defence with his directness and acceleration. McManaman’s style contrasts with that of Beausejour. The 22 year old is the kind of player who can get to the by-line and cut the ball back. He is also a natural goalscorer and can shoot with both feet. Latics need him back to full fitness. James McClean is 24 years old and took a pay cut to join Latics. He is fighting to get a place in the starting line-up. McClean’s workrate cannot be faulted and he is not afraid to run at the opponent’s defence. He has a good left foot and genuine pace. Although he started in 44 Premier League games over the past two seasons he has yet to reach his peak. At times Coyle has played him on the right flank, in the kind of role that Charles N’Zogbia played in the Martinez era. Some say McClean lacks the close control to play in that position, but he can be dangerous when cutting inside to shoot. McClean’s style also contrasts with that of Beausejour. The Chilean is best with the ball played to his feet, whereas the Irishman is at his most threatening when he can use his pace to run on to through balls. Coyle will use him on either flank and with continued playing time McClean is going to get better and better. Nouha Dicko is still only 21 and is another wide player with real pace. His first team opportunities continue to be limited and one wonders when he is finally going to get a start in a league game. Shaun Maloney remains unavailable through injury. When he comes back he is going to have to fight Jordi Gomez and Nick Powell for his best position – the advanced midfield role. We are likely to see him on the wing at times. Coyle has wingers who can be match winners. Providing they can stay fit and that the team lines up with width there are some exciting times ahead for Latics. Grant Holt and Marc-Antoine Fortune will be licking their lips at the service they are going to get from the wide men.